Last night Dennis and I attended Br. Wayne's "profession of vows" in a small monastery church on Chicago's southside. I am still a bit shocked that Wayne invited us. We were two of about 100 people that witnessed Wayne promise to make interreligious dialogue the ministry of his life as he literally prostrated himself before Francis Cardinal George, the Archbishop of Chicago. Let me take a minute for my friends that are not Catholic to explain this ceremony. A "profession of vows" is part of the Sacrament of Holy Orders in the Catholic Church. Equal in importance to the sacrament of Marriage, Baptism, First Communion and Reconciliation, Holy Orders are for people that choose the religious life. As you might expect these sacraments are important and memorable moments that change a person's life. The fact that Archbishop George was the priest saying the mass and hearing Br. Wayne's vows was also momentous. I think that it is normally the head of the monk's order that hears the vows and rarely an archbishop. So this evening was special on many levels. The mass began with eight monks in residence at the small monastery chanting an opening hymn. Incense was strong and the sun shone through the stain glass windows. It was awesome. We saw Wayne proceed down the aisle; he was dressed in orange robes. 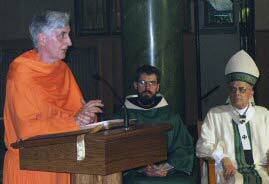 I've never seen orange robes in the Catholic Church, so I was delighted to learn later in the evening that Wayne wore orange because his original vows -- taken in India -- were as a Hindu monk in the Benedictine tradition. (Orange for Hindis means the sun and is a color that they wrap themselves in when they take orders). A friend of Wayne's hosted a reception afterwards that was much like a wedding banquet, and the Cardinal sat at Wayne's right. Suffice it to say, that being in the presence of a Cardinal is like being in the same room with Mayor Daley. Like the Mayor, he is a famous person that guides a specific region of the world, but also like the Mayor he is well known beyond his domain. After dinner, and before dessert, another Wayne friend stood and invited us all to say a few words about Wayne or give him a blessing. After the hostess, the first to accept the offer was a Jewish man that has known Wayne for 10 years or more. He spoke about their deep friendship. Before the toasts ended, a Buddhist woman who heads the Midwest Council praised Wayne, her friend and partner in Interreligious dialogue for years. A Quaker man spoke of Wayne's love of all things of this world including the animals and earth. He noted that in a book dedication, Wayne thanked him, his wife and his children for their love and support. Wayne included Lucy in that list, and the Quaker man informed us with a twinkle in his eye that Lucy was his dog. Several of Wayne's priestly friends (his term not mine) spoke of how he inspires them to be more loving. One said that Wayne was the only person he knew that literally knows the name of all the homeless people in his world. The priest said he had been awed walking the streets with Wayne, who greets the homeless by name saying "Hi Joe. Hello Mary. Hey Tom, I'm going to see the Archbishop today will you pray for me." Another priest spoke of Wayne's devotion. Another of his simplicity. Another told of how despite the vow of poverty, Wayne's check is always the first to arrive when the Parliament of World's Religions needs funds. And as if this wasn't enough (those of you who know me well know that I was silently weeping through much of this), Dennis and I individually spent time with even more phenomenal people. Judy, a hospice nurse who spent six months with Wayne in India, sat on my left at dinner. Next to her was Don, a 10-year friend of Wayne's from an Aikido class (yes the martial arts). Across from Don was another Wayne friend from the same Aikido class who now lives in Indianapolis and drove up for the night. And then there was Joe, Wayne's literary agent. Prior to dinner, we spoke with another Don, a Dominican priest from a Dominican Ashram that in the spirit of Eastern tradition is open to guests of any denomination... in Kenosha of all places. He invited us to pray there anytime. Now, do you understand how humbled I was that we were invited? To close out this little note (okay long), I will borrow words from Wayne's Italian friend who came to the ceremony and spoke at the reception. He noted that Wayne lived a life that honored the words of a famous Italian saint Catherine of Sienna. Said Wayne's Italian friend, "Catherine told people not to be satisfied with the little things but to aim for greatness. She said God wanted greatness." Wayne's friend, like most of us last night, didn't need to be reminded. We knew we were in the presence of greatness.